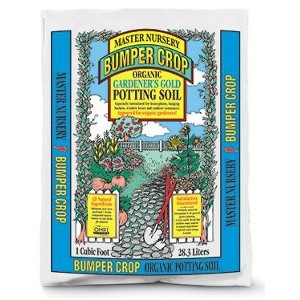 Gardener’s Gold Organic Potting Soil is good for all outdoor and indoor container plants! It is a blend of sphagnum peat moss, composted hen manure, shellfish, perlite, and very old dark bark. It is also pH adjusted with lime, as needed. This product is perfectly suited for houseplants and all general garden planting. Gardener’s Gold Organic Potting Soil is a rich, earthy blend made with natural and organic ingredients with a special water saving formula.